Hello! My name is Robert Mimm and I have provided high quality piano and keyboard lessons for 16 years and enjoyed it immensely. I am currently accepting piano or keyboard students from ages 4 or 5 to adult. It would be a joy to work with you! Please feel free to call me or email me for more information. No obligation, of course. I am a full-time resident of Raleigh and live here with my lovely wife, Jeanne. I studied with a Master Teacher, Earle W. Echternach, from June 1970 until his death in 1973. I have studied over the years with 12 different teacher and learned much from all of them. I hold a B.A. degree from Franklin & Marshall College in Lancaster, PA and majored in Psycholgy-Anthropology as wll as music and art history. My teaching will enable you to play any style of music that you wish. I have taught Classical, show tunes, hymns, and popular tunes. Of course, the emphasis is on Classical. We will work together to see what you want to play and then go in that direction. we will do shapes, games, drawing. All activity will lead the student to musical mastery. Brand new beginners with no musical knowledge as well as people who had lessons in the past and now want to re-start their study. I teach from Beginning to early Advanced. 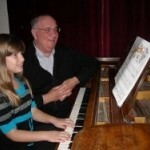 Let others know about Robert Mimm Cary NC Piano Lessons. Did this teacher help you to learn? How long did you take lessons? Are you still playing music? Share any thoughts or stories you have so that others can know about this teacher!